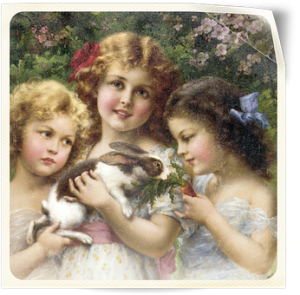 F for Folklore – Family Wise Ltd.
Day 6 of the Blogging from A – Z Challenge and the word we’ve chosen is folklore! 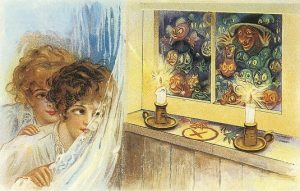 Here is a list of 13 folkloric tales, that may have been involved in your family history! 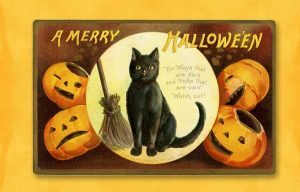 All Hallows Eve or Hallowe’en, as we know it, has many old, strange traditions that you probably didn’t know. At the end of October, the outside world begins to look dark and dreary as nature becomes dormant. Evil spirits and the souls of deceased family and ancestors were believed by many cultures to be wandering around at this time of year. The Welsh called this day “Nos Galan Gaeaf”, known as winter’s eve. The family ‘appeased’ their ancestors by placing food on a windowsill. They asked protection from the spirits that would do them harm and for them to not haunt the family. Young women also often used mirrors which were told to reveal their future lover. In some instances, if the maiden was fated to die before she was wed, a glimpse of her future husband’s face would be shown. 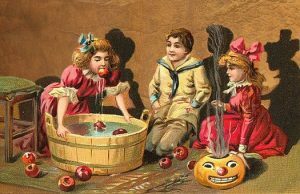 Other games played to determine future prospects included apple bobbing. Seizing an apple in one bite was an indication of good fortune. Old traditions were adapted into the ones we know today, Hallowe’en still remains a particularly spooky time for children of all ages. Chime Hours is said to have originated in the north of England and refers to one of the several myths related to the birth of a child. The story behind this piece of folklore is that those who are born during certain hours of the day or night gain special abilities. These supernatural abilities range from being able to see and communicate with ghosts and faeries, having complete control over animals, being musically gifted, and having the power to cure ailing animals and plants. Children with such influences are known as ‘Chime Children‘. In Germanic mythology, a dwarf is a human-shaped entity that dwells in mountains and in the earth and is variously associated with wisdom, smithing, mining, and crafting. Dwarfs are sometimes described as short and ugly. An Emere, in traditional Yoruba culture, is a child who can travel between the spiritual and physical world at will. It is said to be impatient, wanting the best of heaven and Earth. Usually considered an attractive female with seductive powers, an Emere is a spirit in disguise, misrepresenting death as life, and is clever enough to disguise her objectives. Believed to be more powerful than witches, they most often die on a particular day of joy. Such as wedding days, the birth of their first child, etc. depending on the degree of happiness the event might cause. A boy and his sister were found by men working their fields during harvest time near some ditches that had been excavated to trap wolves at St Mary’s of the Wolf Pits (Woolpit). Their skin had a green hue, their clothing unfamiliar, and their speech was unintelligible to the men. They were taken to the village, where they were eventually accepted into the home of a local landowner. The boy later became sick and soon died, while the girl remained in good health and eventually lost her green tinged skin. 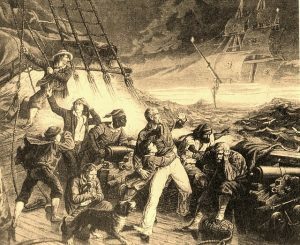 She learned how to speak English and was later married to a man in the neighboring county of Norfolk. According to some accounts (which have not been verified), she took the name Agnes Barre, and the man she married was an ambassador of Henry II. She learned how to speak English, and later relayed the story of her and her late brother’s origins. The girl reported that she and her brother came from the Land of Saint Martin, where there was no sun, but a perpetual twilight and all the inhabitants were green like them. She described another luminous land that could be seen across a river. She and her brother were looking after their father’s flock, when they came upon a cave. They entered the cave and wandered through the darkness for a long time until they came out the other side, entering into bright sunlight, which they found startling. It was then that they were found by the men tending to the fields. One theory from this account is that the children were suffering from Hypochromic Anemia, originally known as Chlorosis, coming from the Greek word ‘Chloris’, meaning greenish yellow. The condition is caused by a very poor diet that affects the color of the red blood cells and results in a noticeably green shade of fair skin. In support of this theory is the fact that the girl is described as returning to a normal color after adopting a healthy diet. 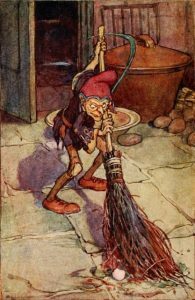 A ‘Hag’ is depicted in medieval folklore as a ‘wizened’, ugly, old woman or a fairy or goddess disguised to appear as one. 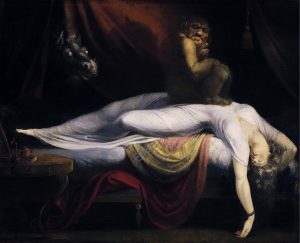 Often seen as malevolent, in English and Anglo Northern American folklore the ‘Old Hag’ was a nightmare spirit that sat on a sleeper’s chest and sent nightmares to the dreaming sleeper. When they woke, the subject would be unable to move or breathe for a short period of time. A condition we have now identified as Sleep Paralysis. Many tales about hags do not describe them well enough to distinguish between an old woman who knows magic or a supernatural being. In Slavic folklore, Baba Yaga was a hag who lived in the woods in a house on chickens legs. She would often ride through the forest on a mortar, sweeping away her tracks with a broom. In Irish and Scottish mythology, the cailleach is a hag goddess concerned with creation, harvest, the weather, and sovereignty. In partnership with the goddess Bríd, she is a seasonal goddess, seen as ruling the winter months while Bríd rules the summer. An Imp is a mythological being, similar to that of a fairy or demon described as causing of mischief rather than being seriously threatening. They are known in Germanic folklore as ‘lesser demons’, who were not seen evil or harmful to humans. 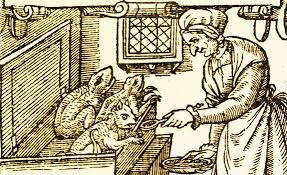 Unlike in old English etymology, particularly in the 16th century, imps were used in expressions such as “imps of servants” and “imps of the devil. Thus, by the 17th century it came to mean a small demon, or a familiar to a witch. Imps were often portrayed as lonely little creatures always in search of human attention. They often used jokes and pranks as a means of attracting human friendship, which often backfired when people became tired or annoyed of the imp’s endeavors, usually driving it away. Even if the imp was successful in getting the friendship it sought it often still played pranks and jokes on its friend either out of boredom or simply because this was the nature of the imp. This trait gave way to using the term “impish” for someone who loves pranks and practical jokes. Jorōgumo from the Gazu Hyakki Yagyō by Toriyama Sekien. 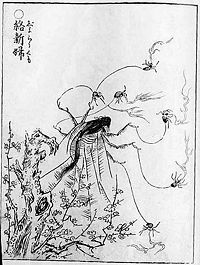 A Jorōgumo is a type of ghost, creature or goblin in Japanese Folklore. It is frequently recalled as a woman-spider that can shapeshift into a beautiful woman. Krampus, the half goat, half demon, terrifying beast is derived from the German word krampen meaning claw. The legend is part of a centuries-old Christmas tradition in Germany, where Christmas celebrations begin in early December. Krampus was created as a counterpart to kindly St. Nicholas, who rewarded children with sweets. 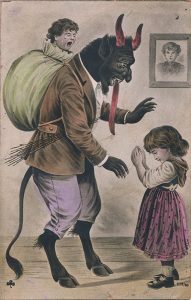 Krampus, in contrast, would swat wicked and ungrateful children, stuff them in a sack, and take them away to his lair. 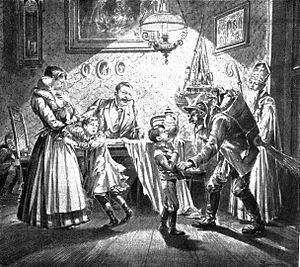 According to German folklore, Krampus shows up in towns, sometimes with Saint Nicholas, on the night of December 5, known as Krampusnacht, or Krampus Night. The next day, December 6, is Nikolaustag, or St. Nicholas Day. On this day, children look outside their door to see if the shoe or boot they’d left out the night before contains either presents (a reward for good behavior) or a rod, or piece of coal (bad behavior). Statue of “La Llorona,” the cursed mother of Southwestern and Mexican folklore. 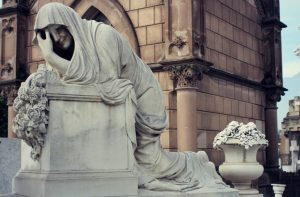 La Llorona or ‘Weeping Woman’, its translation, in Mexican folklore is the ghost of a woman who drowned her two children in a river and cries while she is looking for them, causing misfortune for those who see or hear her. Stuck between the land of the living and the dead, she spends eternity looking for her lost children. La Llorona kidnaps wandering children at night, mistaking them for her own. She begs the heavens for forgiveness and drowns the children she kidnaps. It is said that if her cries sound near, she is actually far away, and if they sound distant, she is actually very close. 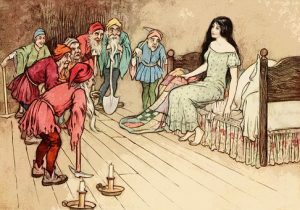 The tale is told to many children in Latin America to scare children from staying out too late.